By Mark Sanders in Permaculture Magazine on Wednesday, 8th May 2013. Haiti is often seen as having the worst sanitation and clean water access in the Western hemisphere. But with the help of SOIL (Sustainable Organic Integrated Livelihoods), waste resources are being transformed into compost, sanitation is improving and local food production is being revived. 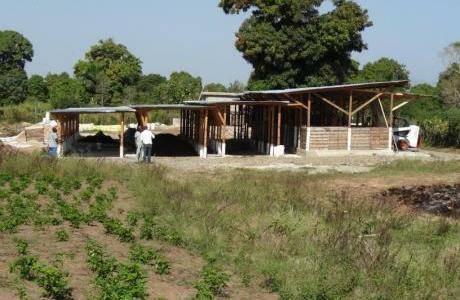 Mark Sanders, a civil engineer explains his research visit to the SOIL project in Haiti. As the global use of inorganic mined fertilisers increases, so do the resulting environmental impacts in the form of increasing Nitrous Oxide emissions and heavy metals in local watercourses and groundwater sources. The use of these already limited resources is not only unsustainable, there are fundamental flaws in what many still believe to be the ideal solution for the treatment of our waste. Yes, we sometimes re-use wastewater bio solids for agricultural use, but shouldn’t we question why we use so much water and energy to obtain this nutrient deficient material? There is a more beautiful, simple way. Over the past 200 years we have been obsessed with the re-circulation of water around our environment, linking back to health issues often associated with human waste. Yet, if we efficiently manage both our faeces and our urine, we can create fantastic organic compost which is full of nutrients and is just waiting to be re-used as fertiliser. All this time, we have neglected to notice the failings in the propagation of nutrients throughout our environment. The time for a modal shift in thinking is now. In March 2013, I visited Haiti for two weeks, working with SOIL (Sustainable Organic Integrated Livelihoods), a non-profit organisation dedicated to protecting soil resources, empowering communities and transforming wastes into resources. I split my time between SOIL’s two operational bases in Port-au-Prince and Cap-Haïtien. SOIL’s primary objective is to facilitate the community-identified priority of ecological sanitation (EcoSan), where human waste is converted to valuable fertilisers through a composting process. 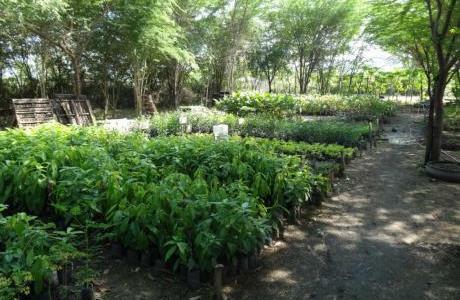 The promotion of EcoSan within Haiti is helping to fight the growing cholera epidemic and wide scale deforestation whilst reviving local food production. When people think of Haiti, the first thing that often springs to mind is the devastating earthquake which rocked the country in January 2010. Although the scars of this earthquake are still evident, there is an inherent subtext to the abject poverty – people are rebuilding their lives. Sanitation and access to clean water in Haiti is often quoted as the worst in the western hemisphere and there is now a growing belief that sustainable sanitation and agriculture are at the heart of the rebuilding process. The first step in the SOIL cycle is providing communities and households with sanitation, and this comes in the form of a Urine Diverting Dry Toilet (UDDT). The UDDT drains urine from the front area and faeces are deposited in the back. The toilet systems that SOIL provides come in three different forms: Household Toilets, Community Toilets and Emergency Toilets (for internally displaced persons – IDP’s). The toilet collection methods vary between a double-vaulted system and a drum collection unit – with the majority of SOIL’s toilets operating under a drum collection system, as the storage units are portable, easy to empty and there is minimal contact with the waste. When depositing faeces in the toilet, a ‘cover material’ is used in order to reduce smells and achieve the optimum Carbon to Nitrogen (C/N) ratio (around 30:1) which is essential to the production of quality compost – SOIL uses locally available waste fibrous material from cane sugar (bagasse) and crushed peanut shells. The urine is collected in a separate container where again it can be transported – however it should be noted that urine transportation has higher labour inputs due to its volume and weight. At the community and emergency toilets, an appointed toilet manager looks after the maintenance and cleaning of the toilets. As a firm believer in the potential of human waste recycling, I was amazed that the toilets themselves did not smell. Because this would be a major ‘turn off’ for most people, it is important to stress that foul smells are caused by the mixture of urine and faeces, where bacteria in the faeces releases the ammonia in the urine. By separating the waste and adding a cover material, smells are not an issue. The second step involves the conveyance of the faeces and urine to the compost site. SOIL has its very own ‘drum run’ where a vehicle (the ‘poop truck’) equipped for transportation of drums travels around the locations of toilets within the respective area and collects the full 15 gallon poop drums and urine containers, also depositing empty drums at the toilet locations for future use. The faeces and urine are then taken to SOIL’s composting facility where the process really gets underway. Waste treatment is undertaken through a technique known as ‘thermophilic composting’, where thermophilic microorganisms in human waste create an environment which destroys pathogenic organisms that may be present by creating high temperatures within the compost pile. 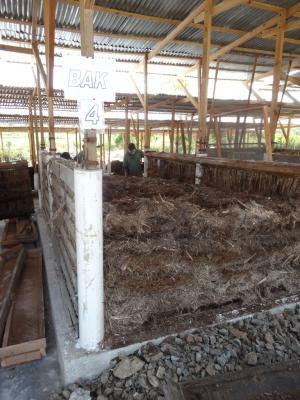 The composting site construction is based on previous best practice and in Cap Haitien, there are six ‘bins’ which each have a capacity of around 12m3. Once a bin is full, it is left for one month before being turned and aerated into another bin. The turning process is crucial as it permits the cultivation of aerobic bacteria which help ensure thermophilic decomposition. The compost is then turned monthly for the 2nd and 3rd months and then on the 4th month it is turned into a windrow (a pile of un-enclosed compost which helps promote high oxygen levels), where it is left to decompose for a further 3-5 months. Throughout the composting process, temperature testing is undertaken every two days at five points across the bin and at two depths (18″ and 36″), to ensure that a minimum temperature of 50°C (122°F) is maintained for at least one week to kill off pathogens which may be present (World Health Organisation standard). SOIL also takes samples throughout the composting process to lab test for both E.Coli and Total Coliforms, thus ensuring safety concerns are mitigated. Once the composting process is complete, it is sifted through a mesh in order to remove any large particles. The end product is a pleasant smelling compost which is safe for re-use in a range of applications. SOIL bags and sells its compost to local farmers, whilst also using it themselves in experimental gardens and agricultural plots to grow a range of agricultural produce. 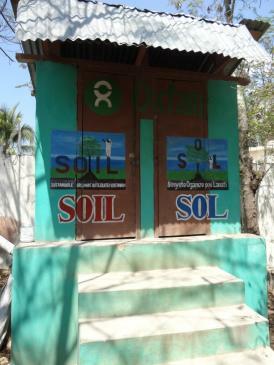 In Port-au-Prince, SOIL clearly demonstrates the potential human waste compost has by maintaining trial beds – with and without compost. The work being undertaken by SOIL in Haiti utilises simple technology and is aptly suited to a developing country with zero sanitation infrastructure. At the same time, their practices are cutting edge and are enabling people around the world to understand the huge potential that human waste has. For those of us who live in a developed country with a high-tech sewerage system, we have a lot to learn from this simplified approach. We need to learn from these examples and get back to the ‘grass roots’ of a sustainable sanitation process. We are now approaching a crossroads in our approach towards sanitation. We must understand that the use of inorganic fertilisers is unsustainable and recognise the huge potential that human waste has to play in the recirculation of nutrients throughout our environment. Public perceptions of human waste are the most important barrier which needs to be crossed in order to achieve acceptance. With this in mind and being an engineer myself, I feel like I have a moral obligation to society to try and change our out-dated misconceptions of what human waste actually is and what it has to offer. The next time you flush your toilet, spare a thought for where it will go and consider how much energy will be used to get that clean supply of water back to your toilet in time, ready for the next flush. Is it really worth it? 1 Reply to "Permaculture Magazine: Recycling Human Waste to Improve Sanitation and Produce Food"
Very interesting and positive for Haiti.